3		Galvanised Cattle Knocking Box. 4		Landing Hoist, (New Chain Fitted). 5		Blood Drain Covers, Dry Landing Covers. 10	3	Stainless Steel Handwash Sterilizers. 12		Smallstock Stunner and 2 Handpieces. 13		Smallstock Stunner and Handpiece. 15	2	Air Circulators, 24". 17		"FMC Powell" Dehairer and Scald Tank. 18		Stainless Steel Shave Table. 19		Elevating Ram and Indexing Ram. 20		Ground Floor, Pig Track and Chain, Electric Drive. 22	2	Aluminium Bleeding Troughs. 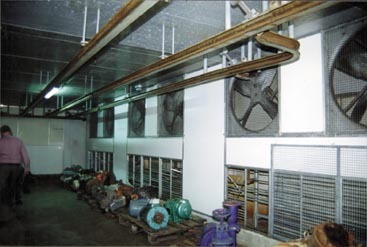 25		"Frick" 1000mm Air Curtain. 32	2	Stainless Steel Handwash Sterilizers. 33	7	Wall Mounted Sterilizer Pots. 36		Hydraulic Power Pack and 4 Slave Drives. 37A		Stainless Steel Personnel Handwash, 3 Station. 38		Floor Mounted Stainless Steel Handwash Sterilizer. 39		Extractor Fan, 24" and Small Air Circulator. 41	36	Fluorescent Lights in Small Stock Floor. 47		Wall Extractor Fan, 24". 48		Viscera Table, 12 Pans Up, 12m. 49	6	Stainless Steel Handwash Sterilizers. 50		Aluminium Stand, 4m, L Shaped. 51	5	Poly Drop Sheets. 52	2	Stainless Steel Basin Drainage Tables. 53		Stainless Steel Draining Table. 54		Stainless Steel Offal Chute. 55		Stainless Steel Handwash Sterilizer. 56	2	Stainless Steel Handwash Sterilizers. 58	6	Sheets Poly Drop Boards. 59		"Sastek" No 7 Rail/Scale with Printer and Stand. 60		Pneumatic Rail Carcase Lift Device. 61		Expanded Poly Styrene Door. 62		Gravity and Captive Rail. 63		Beef Elevating Bleed Chain. 64	2	Bed Dressing Stands. 66	2	Stainless Steel Handwash Sterilizers. 67	2	Stainless Steel Handwash Sterilizers. 68	3	Stainless Steel Handwash Sterilizers. 69		Stainless Steel Tool Sterilizer. 70		Stainless Steel Handwash Sterilizer. 71	2	Stainless Steel Handwash Sterilizers. 72		Stainless Steel Beef head Rail. 73		All Beef Overhead Rails Past Bed Dressing. 76	3	Extractor Fans, 24". 77		"Johnson" Upward Hide Puller. 78		Rise and Fall Platform. 79		Rise and Fall Platform. 80		Rotary Blade Splitting Saw, Electric Motor. 81		Stainless Steel Tail Table. 82	3	Stainless Steel Handwash Sterilizers. 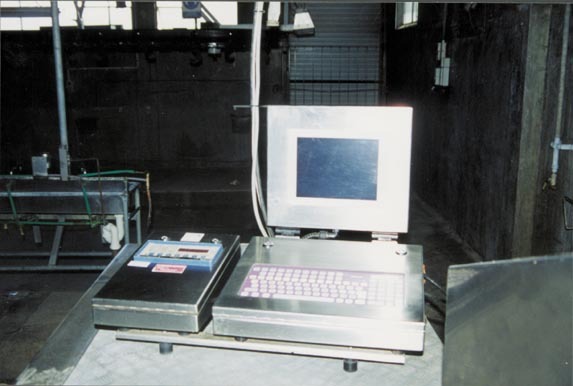 84		Wash Bay and Inspection Stand. 86	8	Halogen and Flood Lights. 90		All Rails Hangers and Switches. 92	2	Poly Styrene Doors, 3.3m. 93	2	Poly Styrene Doors, 2.5m. 96		Aluminium Stand, 2400 x 600mm. 97		Aluminium Stand, 2400 x 600mm. 98		Aluminium Stand, 850 x 450mm. 99		Stainless Steel Trough, 2440 x 570mm. 101		Aluminium Stand, 1200 x 600. 102		Galvanised Stand with Aluminium Top, 4300 x 800mm. 104		Aluminium Cabinet, 460 x 1400mm. 106		Splash Sheild, 1200 x 1400mm. 107		Stainless Steel Wash Tray Stand, 750 x 450mm. 108		Stainless Steel Mobile Tub, 1400 x 600 x 600. 110		Stainless Steel Viscera Trolley. 112		Stainless Steel wash Tray and Stand, 650 x 1560mm. 114	17	Assorted Meat Tubs. 118	2	Stainless Steel Wash Trays, 900 x 600mm. 120		Poly Styrene Door, 3.3m. 121		Captive Rail System and Gates. 122	270	T Track Captive Rollers. 123		All Lights in North Pig Chiller. 124	3	FDC Units (Coil Banks), 10 T.
125	6	Slow Revolution Fan Systems, 36". 126		Poly Styrene Panel and Screens. 128		"Jarvis" 5DM Hydraulic Bricket Saw. 129		"Jarvis" JC Starcraft Air Knives. 130		"Jarvis" JC Starcraft Air Knife. 131		"Jarvis" JC Starcraft Air Knife. 132		"Jarvis" JC Starcraft Air Knife. 133	4	"Jarvis" Air Knives. 134	4	"Jarvis" Air Knives. 135	2	"EFA" Air Knives. 136	2	"EFA" Air Knives. 137	4	"EFA" Air Knives. 138	4	"EFA" Air Knives. 139	5	Boxes Spares for Dehiders. 140		"Jarvis" Hock Cutter, Pneumatic. 143		Sheep Brisket Scissors, (Less 1/2 Blade). 147		"Jarvis" Sheep Hock Cutter, Pneumatic. 148		"Jarvis" Circular Horn Saw. 149		"Kentmaster" 160 Circular Splitting Saw. 150	2	"Kentmaster" 160 Circular Splitting Saws. 152	2	"Best & Donovan" Beef Splitting Saws. 153	2	"Best & Donovan" Recipricating Saws. 155	2	White Wheelie Bins - White Circular PVC Bin, 40lt. 156		Hydraulic Cylinder, 1150 Stroke x 50mm Dia. 159		Splitting Saw Control Box. 170		"Jarvis" Electric Saw Spares. 171		"Jarvis" Electric Saw (New). 172		"S & W" Quartering Saw, Electric. 173		"Toledo" Digital Scale Head, 6000kg. 175	2	Stunner Hand Pieces and Control Box. 176		Assorted "Sastek" No: 7 Scale Parts. 178	2	Stainless Steel Printer Cabinets. 180		"Jarvis" Blade Sharpener, Model BR1. 183	7	Assorted Offal Chiller Stands. 184		Captive Rail System with Gates. 185		All Lights in South Pig Chiller. 186	3	FDC Units (Coil Banks), 10 T.
187	6	Slow Revolution Fan System. 188		Poly Styrene Panel and Screens. 189	3	Poly Styrene Chiller Doors. 190	2	"Jarvis" Circular Pig Saws. Motor,1.1kw - Electric Motor and Gearbox - "G.E"
192		Pump, 4" x 4" and 15hp Electric Motor - "ASEA"
- 2 Pumps, 1.5" and Motors. and Gearbox - Motor and Gearboxes. 194		"Mez Frenstadt" Electric Motor, 30hp. 196		"AEI" 150hp Electric Motor. 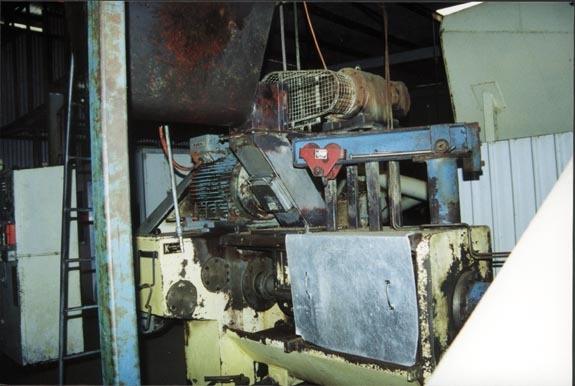 197		"ASEA" Motor Gearbox - Rotary Vane Pump - "AEI"
200		Electric Chain Hoist and Balancer. 201		"Kelly & Lewis" Pump, 2"x 2", Motor. 202		"C&M" Varispeed Motor/Gearbox, 5hp. -"B&W" 90 Degree Gearbox - Air Cylinder, 48" x 3"
Electric Motor - "CP" Electric Motor, 5hp - "CP"
Motor- "ASEA" 5hp Electric Motor. Motor - "Kelly & Lewis" 2b Gearbox - "Indeng"
Centrifugal 1" Pump - Hydraulic Motor. 207		NEW "Teco" 20hp Electric Motor. 208		"CMG" 15kw Electric Motor. 209		"AEI" 7.5hp Electric Motor (Rewind). 210		"Ajax" Centrifugal Pump, 4". 212		Box Assorted Vee Belts, Approx 200. 214		"Gedge" Electronic Rail Scale, 400kg. 215		"Gedge" Electronic Rail Scale, 400kg. 216		All Rails and Switches. 217		All Fluorescent Lights in front Load Out Annex. 219		Switchboard for FDC Control. 220		Expanded Poly Styrene Door. 221	2	Captive Rail Turntables and Rail. 223		Stainless Steel Apron Rack. 224		"Taylor" Floor Mounted FDC Unit, 10 T.
226		All FLuorescent Lights in Offal Chiller. 229		Poly Styrene Door, 2.5m. 230	2	Assorted Offal Stainless Steel Chilling Racks. 231		Stainless Steel Dial Scale, "Brecknell", 50kg. 232		Stainless Steel Draining Table, 1500 x 900mm. 236		Stainless Steel Pack Off Table. 239		All Lights in Head Splitter Room. 240		Stainless Steel Handwash Sterilizer. 242		Head Screw and Chute, 6.5m x 300dia. 244		Stainless Steel Gut Table. 245	4	Assorted Stainless Steel Chutes. 246		Stainless Steel Handwash Sterilizer. 247		All Fluorescent Lights in Gut Room. 250	2	Stainless Steel Handwash Sterilizers. 251		Stainless Steel Wash Tub, 1000 x 600 x 600mm. 254		Freon FDC Unit, 5 T.
256		Poly Styrene Panel Door and Panel. 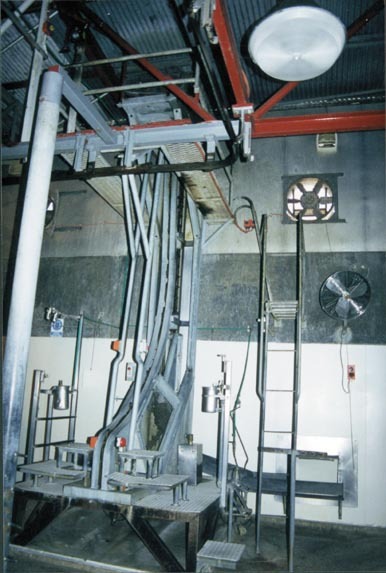 258		FDC Unit, 5 T.
260		Galvanised Wire Cage and Stillage. 262	2	Poly Styrene Doors. 263		Overhead Rails and Switches. 264		All Fluorescent Lights in Meat Hall. 265		"Taylor" Floor Mounted FDC Unit, 6 T.
266		"Taylor" Floor Mounted FDC Unit, 6 T.
267	2	Stainless Steel Handwash Sterilizers. 268		"Gedge" Electronic Rail Scales, 400kg. 269	2	Poly Styrene Panel Chiller Doors. 270		Poly Styrene Panel Door, 1500mm. 271		Powered Lowerator to Boning Room. 272		"Gedge" Bagging Scales, 60kg. 273		"CP" 30hp Electric Motor. 274		"CP" 30hp Electric Motor. Motor - "ASEA" 0.5kw Electric Motor/Gearbox - "CP"
278		High Pressure Water Spray Unit. 280	100	Beef Rollers on Pallet. 281	135	Beef Rollers on Pallet. Electric Motor - "AEI" 7.5hp Armature. 286	Qty	Red Hot Water Hoses. 287	15	Wash Guns and Hoses. 292	Qty	Assorted Hot water Hose. 295	Qty	Stainless Steel Sterilizer. 296	7	Stainless Steel Handwash Sterilizers. 298		Stainless Steel Wall Mounted Table. 301	Qty	Box Light Diffuses. 302		"Hygenic" Stainless Steel Mobile Bandsaw. tion Fan Blades, 23, 25 and 30cm. 308	Qty	Electrical Pasts and Stand. 310	30	Beef Bleeding Rollers. 311		Box 6 Hide Puller Chains. 312	20	Beef Legging Chains. 314	Qty	Beef Bull Rollers. 315	2	Bins Pig Gambrells. 316	3	Bins Mutton Gambrels. 317		Box 20 Plastic Pig Slides. 318	3	Hot Water Urns. Box of Switches, Heat Sensors and Contact Blocks. 325		Beef Dressing Bed and Accessories. 326	3	Fan Motors and Blades. 328	12	"Ferguson" Super Low Loss Ballasts, 240v. 332	3	"CP" A/C Magnetic Line Starters. 333		"ECE" Direct Switching Starter. 335		"Demag" 0.5kw Armature - "Sever" 2.2kw Armature. 336		Pig Burner Hand Piece. 340		Box of Jack Chain. 343		Stainless Steel Draining Table. 346		Stainless Steel Tub Holder. 351		Stainless Steel Tank, 300lt. 352		"Salter" Dial Scale and Stand. 353	Qty	Expanded Poly Styrene Panel and Doors. 354		Stainless Steel Handwash Sterilizer. 356	2	Poly Styrene Doors. 359		Floor Mounted FDC Unit, 5 T.
363		All Poly Styrene Panel in Carton Room. Styrene Doors in Carton Room. 364		All Overhead Rail in Boning Room. 366		Biflow FDC Unit, 10T. 367	2	Stainless Steel Handwash Sterilizers. 369		All Strip Curtains and Poly Styrene Door. 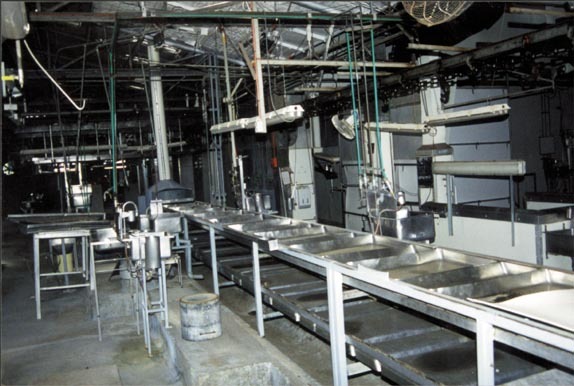 370		Stainless Steel Walk in Apron Wash.
371		Stainless Steel Boot Wash.
372		Personnel Handwash, 3 Station. 374	2	Poly Styrene Doors. 376	2	Freezer FDC Units, 10 T.
378	2	Poly Styrene Doors. 379		All Poly Styrene Panels. 383		"Muller, FDC Unit, 2 Fan. 384		"Muller, FDC Unit, 3 Fan. 385		"Muller, FDC Unit, 3 Fan. 387		All Fluorescent Lights in Freon Freezer Store. 388	7	Freezer Stillages, 8 Tier. 390	4	Freezer Stillages, 7 Tier. 391	5	Freezer Stillages, Assorted. 392		RSJ Frame Annexe, 7m x 7m, Metal Roof Cladding. 397		Extractor Fan and Cage Awning. 398	2	"Rheem" Hot Water Units. 399		Frequency Interter Speed and Tempreture Controls. 400		Poly Styrene Bone Trolley Cover. t on Load Cell with Digital Readout. 402		Stainless Steel Handwash Sterilizer. 403		Screw Conveyor From Hasher Washer, 30'x 9". 409		Stainless Steel Handwash Sterilizer. 412		"Alfa Laval" Spiral Heat Exchanger. 414		Overhead Gantry and 1 Tonne "Demag" Hoist. 417		Charging Lid for Digester. 419		Hot Water Tank, 82 deg C.
420		Hot Water Tank, 82 deg C.
421		Hot Water Tank, 42 deg C.
422		"Southern Cross", 25hp, Hot Water Pump. 423		"Southern Cross", 25hp, Hot Water Pump. 424	3	Hot Water Pumps. 425A		Screw Conveyor Pump? 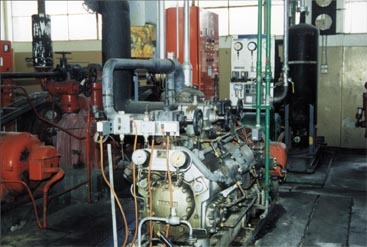 ?, 2.2kw. 426		Annex Over Hot Water Tanks, 18m x 4m. 427		Batch Cooker, 12'x 5' with Drive. 428		Batch Cooker, 12'x 5' with Drive. 429		Dual Cooker Perc Pan with Screw. 430		Batch Cooker, 10'x 5' with Drive. 431		Waste Heat Exchanger, Cyclone and Pipework. 433		Exit Screw From Perc Pan to Press. 435		Pallet Spares for "Keith" 1037 Press. 436		Cake Bin, 10 Ton. 437		Screw Conveyor to Cake Bin. 438		Blood Screw to Cake Bin. 442		Blending Bin, 8 Ton. 443		Screw Conveyor to Blending Bin. 446		Meal Return Screw to Cake Bin. 457		Step Ladder and Fan. 458		Stainless Steel Handwash Sterilizer. 461	2	Tallow Hand Wash/Settling Tanks. 462		"De Laval" Polisher, Model       . 464		D30 Mono Tallow Pump. 465		"Stampco" Hogger and Drive, 15kw. 466		D10 Mono Tallow Pump. 467	2	Mild Steel Tallow Wash Tanks. 468		D40 Mono Tallow Pump (under plant). 472		Garden Type Shed with Extractor Fan. Poly Styrene Door - FDC Unit, 3 T.
474		"Demag" Electric Hoist, 500kg. 477		"Seipa" DL80 Air Diaphragm Pump. 478	2	Iron 4" Valves. 479		Saveall Unit: Chains, Sprockets and Drives. 480		"Southern Cross" 2" x 2" Motor Pump. 481		"Southern Cross" Piston Bore Pump. 482		Mild Steel Plate Top, 1000 x 1200mm. 483		Assorted Aluminium and Screen Offcuts. 485		Stainless Steel Plate Top, 2400 x 1500mm. 489		Rise and Fall Platform Pieces. 494		Cast Steel Beef Droppers. 495		Universal Beam and Rolled Pipe. 496	2	Screw Casings, 300mm. 497	2	Lengths Ammonia Pipe, 100 x 150mm. 498		Screw Casing, and Flight, 500mm. 499		Screw Casing, and Flight, 300mm. 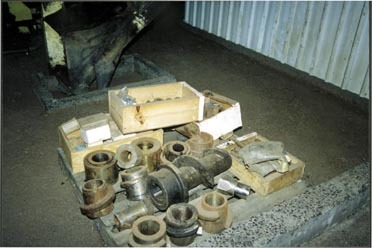 500	6	Drums Milds Steel Hooks, Rollers, etc. 504	3	A Frame Roller Racks. 505		Stainless Steel Offal Table and Hangers. 513		Screw Conveyor, 500 x 15000mm, High Side. 514	3	Screw Flights, 2 x 250 & 1 x 200. 515	4	Pallets New Fire Bricks. 517		Offal Bin, Twin Screw Base. 519		Mild Steel Offal Surge Bin. 520		"Hyco" Registered Forklift Cage. 521	3	Mild Steel Vertical Tallow Tanks on Stand. 523		Stainless Steel Cryovac Poly Offcut Tank. 524		Hydraulic Head Splitter (Beef). 526		Pallet Sheep Logging Rings. 527		Stainless Steel Mono Pump (Blood). 529		Stainless Steel Tally Bench. 531		Part "Vickers" Power Pack. 532	2	"Ultrafilter" Ceramic Air Filters, 100mm. 534	2	"Weir" Multi Stage Pumps, 25hp. 538	9	Lengths Screw Conveyor Flights, 250mm - total 27m. 539	12	Lengths Screw Conveyor Flights, 300mm - total 36m. 542		"Stampco" Smallstock Restrainer Race. Cooker, 12'x 5' with Gearbox and Motor. 545		Blow Tank, 1m x 1.6m. 546	2	"Kelly & Lewis" Self Priming Pumps, Model 13-a2-b. 547		Sheep Pelter, (No Motor). 548		Sheep Pneuamtic Head Skinner. 549		"Vickers" Power Pack with 2 Motored Pumps. 550		"Alfa Laval" Plate Heat Exchanger, Model R45HBM. 551		"Alfa Laval" Plate Heat Exchanger, Model P15. 552		Blow Tank, 1.5 x 1.8m. 555		"Alfa Laval" Plate Heat Exchanger, Model P14 Hbm. 556		"Alfa Laval" Plate Heat Exchanger. 559	Qty	Poly Styrene Panel. 563		"Keith" Beef Hogger, 100hp. 564	260	Box Sheep Logging Rings, Approx. 565		"Warman" 100/100 Series A Type TC Pump. 566	2	Multiwing Fans, 600mm. 567		Box Heavy Duty Gambrels and Chain. 568		Box Sheep Loggin Rings. 569		"Ozone" Welding Fume Extractor and Air Blower Fan. 572		"Hydrotitan" 4" x4" Pump, 37kw. 574		Sheep Chain Reduction Gearbox Drive. 575		Air Compressor, Two Stage, 5hp and Air Blower. 576		Mobile Shredder with Motor. 577	25	Stainless Steel Offal Hanging Racks. 578		Tub Pig Gambrels and Sheep Slides. r, Basket 800 x 600 x 450mm. 580		"Cryovac" Chest Type Shrink Tank. 582		Stainless Steel Drainage Trough, 2.3 x 5.6m. 583		Stainless Steel Drainage Table, 3.3 x 1.2m. 584		Stainless Steel Headwash Cabinet. 600		Hydrovane, 15hp Air Compressor and Air Receiver. 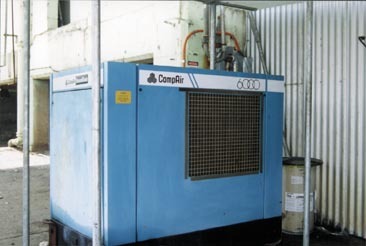 601		"Compair" 6000 Air Compressor, 30kw. 602		"Broomwade" Air Compressor, 60hp, (Parts Only). "Kelvinator" Low Profile FDC Unit. 604		"Kelvinator" Freon Compressor and Condensor. 606		Electrical Cable Above Ground. 611		Assorted Spares and Ammonia Valves (1 Room). 613	Qty	Steam Parts (1 Room). 615		"Yokagawa" 24 Point Pen Temp Recorder. 616		Auto Phone Alarm System. 620		"Bell" Twin Vertical Model CV1 - 100hp. Refrigeration Compressor, 200hp Electric Motor. Refrigeration Compressor, 25hp Electric Motor. 627		Vertical Lowside Accumulator with 2 "Nikkiso"
628		Ammonia Receiver, 5m x 750mm dia. 629		Ammonia Receiver, 4000 x 750mm. 630		"W & S" 150 Ton Condensor, Two Fan. 631		Atmospheric Condenser, 200 Ton. 632		"Armstrong" NH3 Auto Purger. 634		Ammonia Bottle Safety Stand, 56kg. 635		Fuel Oil Stroage Tank, 10000 Gal, Horizontal. 636		Plant Room Electrical Switchboard. 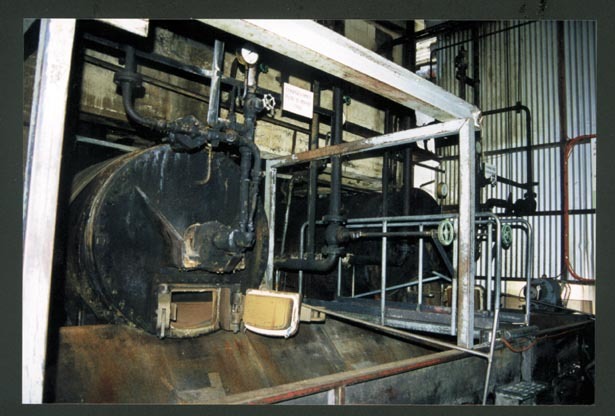 640		"Continental" Oil Fired 3MW Economic Boiler. 643	3	Chemical Dosage Pumps. 644		"Weirs" Boiler Feedwater Pump. 645		"Grundfoss" Model CR4 Pump. 646		Steel Hotwell Feedwater Tank, 18' x 4' Dia. 648		Screw Conveyor Enclosed to 6 Tonne Bulk Bin. 652	3	Enclosed Screw Conveyors, 20'x 9" - Ash Handling. 653		Coal Bin with Screw Conveyor. 658		Timber Rails and Gates to Pens 1 through to 12. 661		Western End Metal Roof 80'x 40' to Unloading Race. 662		Rails, Gates and Floor to Western End. 664		Roof Over Cattle Yards, L Shaped, 22mm x 26mm. 665		Suspect Crush and Pens. 666		Gates and Rails Under Roofed Cattle Pens. 667		Outside Stock Rails and Gates in Nearby Yards. 668		Race and Roof Over to Knocking Box. 669		Black Poly 2" Pipe. 671	2	Skin Agitators, Electric. 675		Oxy Trolley Hoses and Gauges. 676		Oxy Trolley Hoses and Gauges. 677		Hydraulic Press, 10 T and Power Pack. 679	3	Bags, 3/4" Galvanised Nuts and Bolts. 681		Wheel Barrow and Contents. 683		Quarter Door Locker Unit. 684		"Bramley" Cropper, Vyce and Bench. 685	Qty	Welding Elecrodes on Bench. 686		Choke Welder, "EMF", 3ph. 692		"Hitachi" Circular Saw, 9". 695		"Bosch" Drill, Model SB4502. 698		"B & D" Heavy Duty 3/4" Drill. 700		"Atlas Copco" 4" Grinder and Another. 702		Stainless Steel Topped Table. 702B		"Dyna" Ramset Drill and 2 Drills. 703		"B & D" Industrial Vacuum. 708		Oxy Kit and Box. 715	5	Part Sets Stock and Dies. 716	14	Boxes Assorted Parts. 718		Cattle Hoist Lift Chain. 719	13	Boxes Assorted Parts. 720		Cupboard, Fridge and Locker. 721		Steel Table and Contents. 722		Steel Table and Contents. 723		Steel Table and Contents. 728		"Bostitch" Nail Gun Parts. 729		Drop Abrasive Cut Off. 733		Balance Contents, Bench, Bearings, etc. 734		Heavy Duty Welding Bench with Shear and Vyce. 737		Contents of Electrical Room. 738		Lifting Gear on Rack. 741		"Rigid" Pipe Threader, Model 535. 743	2	Aluminium Ladders, 6'. 748		"Lincoln" Idealarc Welder, Model TM 300. 751		Oxy, Electrical and Air Leads. 754	Qty	Beef Saw Blades. 755	Qty	Pig Saw Blades. 756		Peg Board and Contents. 757		Brass Fittings and Valves (New). 759		Wire Rope and Slings. 760		Bay Nuts and Bolts with Drawers. 761	Qty	Plumbers Fittings (7 Bays). 762	4	Bays Steel Shelving and Contents. 764	4	Bays Steam Fittings. 765	1	Bays and Contents. 766		End Bay and Contents. 767	4	Bays and Contents. 771		Filing Cabinet, 4 Drawer. 772		Filing Cabinet, 4 Drawer. 774		Steel Rack and Contents. 778	3	Part Rolls Galvanised Mesh. 779		Pulleys and Sprockets on Wall. 782		Contents of Lunch Room. 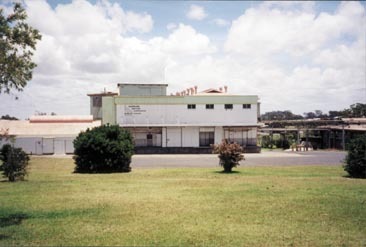 783		Steel Frame Workshop, Iron Clad, 23m x 23m. 784		Contents of Oil Store. 785		Steel Frame Garage, 10m x 6m. 787		Diesel Tank and Stand. 794		"Rigid" Drain Cleaner and Rods. 795		Pipe Line Glands and Conector. 796		Pnuematic Hammer and Points. 797		Fibro Conectors (1 Pallet). 799	6	Stainless Steel Racks. 800		Pallet Pipe Line Conectors. 802	9	Boxes Assorted Fittings. 806	3	Stainless Steel Handwash Sterilizers. 807		Semi Automatic Carton Strappers. 808		Carton Store SHed, 12m x 12m. 809		By Products Building, 30 c 20m, Iron Clad. 811	3	Sharpening Stone Benches. 816		Personnel Handwash, 6 Station. Type B, Serial No 5427. 819		"Mitsubishi" 4 Tonne Tipper, Unregistered. 820		"Mitsubishi" 4 Tonne Tipper, Unregistered. 821		"Mitsubishi" Cantor Tippe, 2 Tonne. 822		"Chamberlan" Front End Loader. 823		"Ferguson" 135 Farm Tractor with Carry All. 831		"Grundfros" Bore Hole Pump. 849		Timber Clad Structure on Timber Stumps, 10'x 20'. 851	2	Laminex Tables and 5 Stools. 852		Timber Clad Structure on Timber Stumps, 40'x 20'. 853	7	Lockers and Contents. 855		Truck Box Body On Stand. 857		Silky Oak Boardroom Table and 8 Chairs. 864		Silky Oak Desk, Glass Top. 868		Laminex Dining Table, Large. 869	2	Dining Tables, Small. 874	2	Paper Towel Dispensers. 875		"Rheem" Hot Water Heater, 160ltr. 876		Timber Shelf Unit and Cabinet in Storage Room. 887		Filing Cabinet, 4 Drawer. 888		Filing Cabinet, 4 Drawer. 889		Filing Cabinet, 4 Drawer. 890		Filing Cabinet, 4 Drawer. 891	2	Filing Cabinets, 4 Drawer. 892	2	Filing Cabinets, 4 Drawer. 893	3	Filing Cabinets, 4 Drawer. 894		Filing Cabinet, 2 Drawer. 895		Filing Cabinet, 2 Drawer. 896	15	Assorted Metal Frame Chairs. 898		"Canon" Photocopier, Model NP 1520. 899		"Epson" Printer, Model EPL-4200. 900		"Canon" Facsimile, Model FAX-230. 906		"Casio" Electronic Calculator, Model DR-1220. 910		"Olevetti" ET 121 Electric Typewriter. 913	2	Lockers and 2 White Tubs. 914		"Rex" Rotary 100 Printer.